The portion of my life which has taken place in the "Computer Age" has been spent in search of the perfect computer card game. By now, I've tried nearly every one on the market, and some have briefly held my interest, though most have not. Recently, however, I played a game that not only captivated me, but also my seven year old daughter, renowned for the world's shortest attention span. Get ready for Hoyle's Book of Games. 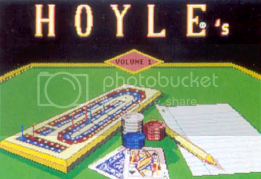 Unlike most of it's competition, Hoyle's offers 6 card games: Cribbage, Gin Rummy, Crazy Eights, Hearts, Old Maid, and even Klondike Solitaire. This element of variety is a big plus for me, as it virtually eliminates tedious disk-shuffling between card games. For the first time in any computer card game, Hoyle's allows you to choose from 18 challengers; many are characters from your favorite Sierra games, some are making their "screen" debut in Hoyle's. Each character has a distinct personality and playing style. Each is more adept at some games than others, offering a choice of skill level from amateur to expert in the game you choose. I could spend all day telling you how terrific Hoyle's is, but I'd rather play. 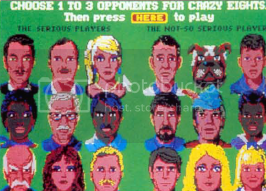 So let me tell you how Hoyle's taught me to play hearts (with help from Princess Rosella, Roger WIlco, and Leisure Suit Larry)! As a beginner at Hearts, I wanted opponents with low skill levels. I selected a young man who introduced himself as "The Kid", a Hearts expert. I didn't feel up to such a challenge quite yet so I moved on — The Kid was noticeably disappointed. Next, I chose Roger, who mumbled something about a Star Generator, asked "W-where am I?" and announced that he was a Hearts novice. As I attempted to begin the game, Rosella said, "We shall need more players for this game." Silly me. I selected Rosella, also a novice. Just for the heck of it, I asked Larry, a Hearts "amateur", to join us. Roger dealt, and I was prompted to choose 3 cards to pass on. As I wondered which cards to pass, my three friends waited and soon began to look bored. Larry's eyes shifted, and Roger grinned expectantly. Finally, Rosella spoke: "Have I spoken to you of my perilous quest into Tamir? 'Tis not a story for the faint hearted! Questing is a family tradition in Daventry. My brother, Alexander, once saved me from a foul dragon!" "I think rescuing a lady from a dragon is a great way to make a first impression!" Larry offered. As the game got moving, Rosella told us of her perils, and Larry made the occasional uncouth comment. Roger seemed preoccupied with one subject in particular, the fact that he seemed to have fallen into the wrong game. Rosella led the hand with an 8 of diamonds, and it was my turn to play. I was out of diamonds, so I played the 4 of spades. Rosella said kindly, "You must follow with another card in suit." Again, I attempted to play the 4 of spades. Roger remarked impatiently, "You have to follow in suit! Did you swap brains with a defective android this morning, or what?" I sighed, sorted my cards, and voila! There it was, a 6 of diamonds. It had been hiding behind the 9 of hearts! Sheepishly, I played the 6. Boy, were these guys ever sharp! As Larry dealt the next hand, Roger whispered to Rosella, "Listen, if you get me out of this game, I'll give you an authentic autographed Roger Wilco pulseray! How 'bout it?" "I'm always interested in that," Rosella giggled, and winked at me. Larry, feeling left out of the conversation, said "Did I tell you guys about the gorgeous KGB agent that tried to get me? What a babe!" "I'm always interested in that." joked Roger. As the game progressed, I was able to learn the rules with the aid of my opponents. When I attempted an incorrect play, they rushed to my aid with helpful advice and comments. I enjoyed sparkling conversation as well as an entertaining soundtrack. If your family is looking for a computer card game that has variety, great graphics, built-in friends and music, Hoyle has all that, and brains too!